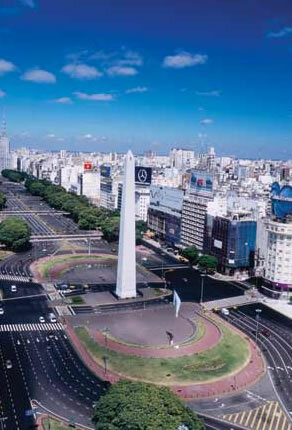 Argentina offers a wide variety of flights from and to every region in the country. In this article, we want to tell you more about the two airports in Buenos Aires, the most visited destinations and some other details you need to know if you are going to travel. The two airports in Buenos Aires are Ezeiza (International Airport Ministro Pistarini) and Aeroparque Metropolitano Jorge Newbery. These airports have a difference: Ezeiza is an international airport, that is to say, you can use it to travel to other countries in the world. If you come from a non-bordering country, this will be the airport you will be arriving in Buenos Aires. Aeroparque Metropolitano Jorge Newbery (or just Aeroparque), on the other hand, is the airport we use only to travel to Argentine provinces and bordering countries like Chile, Uruguay, Bolivia and Brazil. Ezeiza is located at freeway Tte. Gral. Ricchieri Km 33,5 (it is important to say that Ezeiza is located outside the city of Buenos Aires, but near it). Aeroparque is located at Rafael Obligado avenue (no number, because Aeroparque reaches this entire avenue). If you are getting a cab, the driver will know the location. If you are going by car, just follow this avenue until you see the entrance. You wont find any intersection. You can find more information in the website of Aeropuertos Argentina 2000. From these two airports, we can travel to many regions in Argentina and to other countries in the world. What do I need to take to the airport? When you are going to the airport, it is very important to have certain documentation in your hand, so you dont have to waste time looking for it in your suitcase or returning home or to the hotel for it. First of all, you need a personal ID if you are going to travel within the country. If you are going to travel abroad, you will also need a visa and the passport. Certain countries ask for vaccination certificates, letters of invitation, etc., so you need to have this information clear in advance. In case of a minor travelling, besides all the before mentioned documents, the traveler will need a certificate with the authorization of the parents to get on the plane. You will also have to take into account the amount of money (cash and checks) that you can have with you. Every country establishes a different allowed amount of money to have with you. In the case of a big sum of money, you will have to show (with taxes documentation) where that money comes from. Finally, try to be at the airport with plenty of time, just in case. The check-in and the verification of the documentation may take some time, depending on the control process. You cannot be at the airport only 20 minutes before your departure.